On the occasion of the nationwide held girls-future day the so called Girls‘ Day took advantage of 12 ninth graders from inner Leipzig schools and gave them the opportunity to learn about careers at ICCAS in computer-assisted surgery. A sector in which women are unfortunately still under-represented. 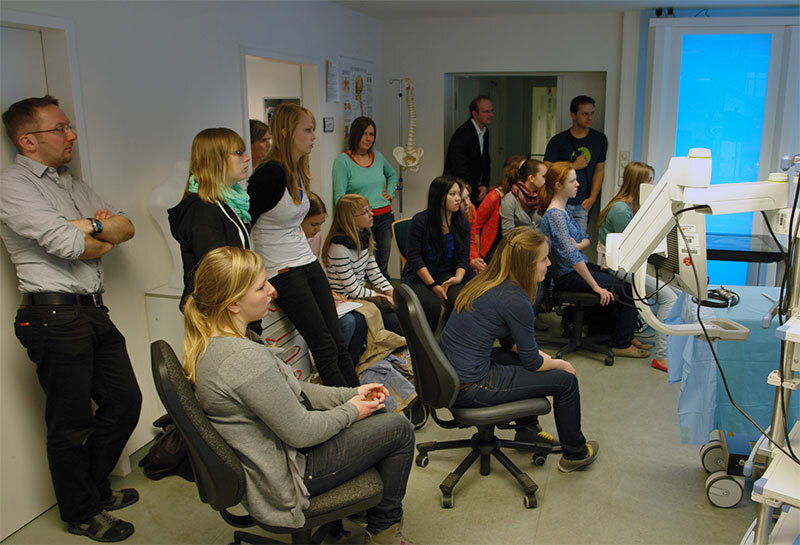 In the ICCAS demonstrator OP Silvia Born explained how such things as 3D visualization can be used in the planning and implementation of ENT surgery. Sandra Schumann demonstrated the analysis of work processes throughout an operation based on a study of pediatric surgery. Stefan Bohn showed how computer-aided navigation and ultrasound can help the surgeon in the operating room of the future in the targeted and gentle removal of brain tumors. Claire Chalopin presented the computer segmentation of tumors from MRI data. There was also a great interest in the 3D printer that produces fast and accurate head models based on the patients data. Hope to see you again. Maybe as a participant at the ICCAS.